Sign up for email updates to CatchUP with ScaleUP! You already know success. Get visible and get ready to scale. Many business owners have difficulty transitioning from running their businesses to focusing on growing their businesses. For four months, ScaleUP! 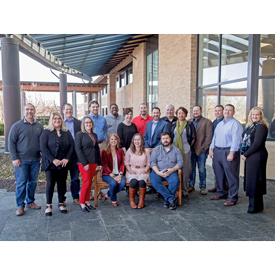 Kansas City will immerse up to 15 entrepreneurs in courses and collisions that will connect them with a high caliber network of peers, resources and mentors and change the trajectory of their businesses. You can apply here to be considered for acceptance into ScaleUP! KC and drive your business to even greater heights. The cornerstones of ScaleUP! Kansas City are FastTrac® Listening to Your Business™ and FastTrac® Growth Venture™, proven energizers for businesses positioned to scale. Courses are supplemented with Kauffman Founders School, peer-to-peer round tables and “collision” sessions that unite you with subject matter experts. The most meaningful part of ScaleUP! is the lifelong connections you’ll make with your peer cohort—other entrepreneurs who face the similar challenges as you. We know that entrepreneurs and small business owners are a critical part of our economic vitality, nationally and right here in Kansas City. ScaleUP! Kansas City is both a commitment and an opportunity for us to remove barriers for our homegrown businesses to grow and scale.